particularly surgery, is at an end. Surgical robots have entered the field in force. Robotic telesurgical machines have already been used to perform transcontinental cholecystectomy. Voice-activated robotic arms routinely maneuver endoscopic cameras, and complex master slave robotic systems are currently FDA approved, marketed, and used for a variety of procedures. It remains to be seen, however, if history will look on the development of robotic surgery as a profound paradigm shift or as a bump in the road on the way to something even more important. Paradiugm shift or not, the origin of surgical robotics is rooted in the strengths and weaknesses of its predecessors. Minimally invasive surgery began in 1987 with the first laparoscopic cholecystectomy. Since then, the list of procedures performed laparoscopically has grown at a pace consistent with improvements in technology and the technical skill of surgeons. The advantages of minimally invasive surgery are very popular among surgeons, patients, and insurance companies. Incisions are smaller, the risk of infection is less, hospital stays are shorter, if necessary at all, and convalescence is significantly reduced. Many studies have shown that laparoscopic procedures result in decreased hospital stays, a quicker return to the workforce, decreased pain, better cosmesis, and better postoperative immune function. As attractive as minimally invasive surgery is, there are several limitations. Some of the more prominent limitations involve the technical and mechanical nature of the equipment. Inherent in current laparoscopic equipment is a loss of haptic feedback (force and tactile), natural hand-eye coordination, and dexterity. Moving the laparoscopic instruments while watching a 2-dimensional video monitor is somewhat counterintuitive. One must move the instrument in the opposite direction from the desired target on the monitor to interact with the site of interest. Hand-eye coordination is therefore compromised. Some refer to this as the fulcrum effect. Current instruments have restricted degrees of motion; most have 4 degrees of motion, whereas the human wrist and hand have 7 degrees of motion. There is also a decreased sense of touch that makes tissue manipulation more heavily dependent on visualization. Finally, physiologic tremors in the surgeon are readily transmitted through the length of rigid instruments. These limitations make more delicate dissections and anastomoses difficult if not impossible. The motivation to develop surgical robots is rooted in the desire to overcome the limitations of current laparoscopic technologies and to expand the benefits of minimally invasive surgery. From their inception, surgical robots have been envisioned to extend the capabilities of human surgeons beyond the limits of conventional laparoscopy. The history of robotics in surgery begins with the Puma 560, a robot used in 1985 by Kwoh et al to perform neurosurgical biopsies with greater precision. Three years later, Davies et al performed a transurethral resection of the prostate using the Puma 560 This system eventually led to the development of PROBOT, a robot designed specifically for transurethral resection of the prostate. While PROBOT was being developed, Integrated Surgical Supplies Ltd. of Sacramento, CA, was developing ROBODOC, a robotic system designed to machine the femur with greater precision in hip replacement surgeries. ROBODOC was the first surgical robot approved by the FDA. Also in the mid-to-late 1980s a group of researchers at the National Air and Space Administration (NASA) Ames Research Center working on virtual reality became interested in using this information to develop telepresence surgery. This concept of telesurgery became one of the main driving forces behind the development of surgical robots. In the early 1990s, several of the scientists from the NASA-Ames team joined the Stanford Research Institute (SRI). Working with SRI's other robotocists and virtual reality experts, these scientists developed a dexterous telemanipulator for hand surgery. One of their main design goals was to give the surgeon the sense of operating directly on the patient rather than from across the room. While these robots were being developed, general surgeons and endoscopists joined the development team and realized the potential these systems had in ameliorating the limitations of conventional laparoscopic surgery. The US Army noticed the work of SRI, and it became interested in the possibility of decreasing wartime mortality by "bringing the surgeon to the wounded soldier-through telepresence." With funding from the US Army, a system was devised whereby a wounded soldier could be loaded into a vehicle with robotic surgical equipment and be operated on remotely by a surgeon at a nearby Mobile Advanced Surgical Hospital (MASH). This system, it was hoped, would decrease wartime mortality by preventing wounded soldiers from exsanguinating before they reached the hospital. This system has been successfully demonstrated on animal models but has not yet been tested or implemented for actual battlefield casualty care. Several of the surgeons and engineers working on surgical robotic systems for the Army eventually formed commercial ventures that lead to the introduction of robotics to the civilian surgical community. Notably, Computer Motion, Inc. of Santa Barbara, CA, used seed money provided by the Army to develop the Automated Endoscopic System for Optimal Positioning (AESOP), a robotic arm controlled by the surgeon voice commands to manipulate an endoscopic camera. Shortly after AESOP was marketed, Integrated Surgical Systems (now Intuitive Surgical) of Mountain View, CA, licensed the SRI Green Telepresence Surgery system. This system underwent extensive redesign and was reintroduced as the Da Vinci surgical system. Within a year, Computer Motion put the Zeus system into production. The world's first surgical robot was the "Arthrobot", which was developed and used for the first time in Vancouver, BC, Canada in 1983. The robot was developed by a team led by Dr. James McEwen and Geof Auchinlek, in collaboration with orthopaedic surgeon, Dr. Brian Day. National Geographic produced a movie on robotics which featured the Arthrobot. In related projects at that time, other medical robots were developed, including a robotic arm that performed eye surgery and another that acted as an operating assistant, and handed the surgeon instruments in response to voice commands. • In 1985 a robot, the PUMA 560, was used to place a needle for a brain biopsy using CT guidance. • In 1988, the PROBOT, developed at Imperial College London, was used to perform prostatic surgery. • In 1992, the ROBODOC from Integrated Surgical Systems was introduced to mill out precise fittings in the femur for hip replacement. Further development of robotic systems was carried out by Intuitive Surgical with the introduction of the da Vinci Surgical System and Computer Motion with the AESOP and the ZEUS robotic surgical systems. The ARTHROBOT is a bone mountable hip arthoroplasty surgery robot. This robot system is small, doesn't use CT data and shows fast registration. Intuitive Surgical bought Computer Motion in 2003; ZEUS is no longer being actively marketed. The da Vinci Surgical System comprises three components: a surgeon’s console, a patient-side robotic cart with 4 arms manipulated by the surgeon (one to control the camera and three to manipulate instruments), and a high-definition 3D vision system. Articulating surgical instruments are mounted on the robotic arms which are introduced into the body through cannulas. The surgeon’s hand movements are scaled and filtered to eliminate hand tremor then translated into micro-movements of the proprietary instruments.The camera used in the system provides a true stereoscopic picture transmitted to a surgeon's console. The da Vinci System is FDA cleared for a variety of surgical procedures including surgery for prostate cancer, hysterectomy and mitral valve repair, and is used in more than 800 hospitals in the Americas and Europe. The da Vinci System was used in 48,000 procedures in 2006 and at that time was selling for about $1.2 million. Robotics-assisted surgery has become enormously popular, with physicians around the world performing 1.5 million procedures — from hysterectomies to heart valve repairs — in 2011. “But myths and misconceptions about robots in the operating room still abound,” says physician Dr. Keith Chisholm, MD, a board certified general surgeon on staff at Medical Center Trinity and Florida Hospital North Pinellas. “One is that the robot performs the surgery,” says Dr. Chisholm. “Technically, it’s not a robot because it can’t perform surgery without someone controlling it — it’s actually computer-assisted surgery. The surgeon guides all of the movements using finger-manipulated controls. ”He and other robotics surgeons use the da Vinci Surgical System, which the U.S. Food and Drug Administration approved for minimally invasive surgeries in 2000. Nine years later, the da Vinci was being used in 80 percent of surgeries to remove cancerous prostates, according to its maker, Intuitive Surgical Inc.
“The benefits of robotics-assisted surgery are numerous,” says Dr. Chisholm, who performs several different procedures using da Vinci and became the first Pinellas-Pasco physician to use it for a single-incision cholecystectomy (gall bladder removal). “The robotic arms hold miniaturized surgical instruments, so we can get in through very small incisions,” he says. “That means there’s less chance of infection, less pain, much less scarring and a quicker recovery time. “Because the arms have ‘wrists’ that can rotate more than 360 degrees, we have far more maneuverability than we do with laparoscopic surgery, and we can get into hard-to-reach areas.“One of the robotic arms holds a magnified 3D high-definition camera, which gives us a much better view of the surgical site than we would have with just our own two eyes,” he said. In a 2013 FDA survey, surgeons experienced with da Vinci said their patients have less bleeding, fewer complications, much quicker recovery times and less time in the hospital — 24 hours on average. Interestingly, those who used da Vinci to remove advanced cancer in the tonsils region of the throat said half of their patients were able to avoid chemotherapy. A study by University of Pennsylvania health economist Andrew J. Epstein published in July 2013 in JAMA Surgery found that half of the minimally invasive procedures reviewed, including robotics-assisted and laparoscopic surgeries, cost insurance providers less than the same surgeries performed in the traditional manner. Four of the six minimally invasive surgeries also resulted in fewer lost work days — sometimes several weeks fewer. • In 1997 a reconnection of the fallopian tubes operation was performed successfully in Cleveland using ZEUS. • In May 1998, Dr. Friedrich-Wilhelm Mohr using the Da Vinci surgical robot performed the first robotically assisted heart bypass at the Leipzig Heart Centre in Germany. • On September 2nd 1999, Dr. Randall Wolf and Dr. Robert Michler performed the first robotically assisted heart bypass in the USA at The Ohio State University. • In October 1999 the world's first surgical robotics beating heart coronary artery bypass graft (CABG) was performed in Canada by Dr. Douglas Boyd and Dr. Reiza Rayman using the ZEUS surgical robot. • On November 22, 1999 - the first closed-chest beating heart cardiac hybrid revascularization procedure is performed at the London Health Sciences Centre (London, Ontario). In the first step of the procedure Dr. Douglas Boyd used Zeus to perform an endoscopic, single-vessel heart bypass surgery on a 55 year-old male patient's left anterior descending artery. In the next step of the procedure William Kostuk, MD, Professor of Cardiology of the University of Western Ontario, completed an angioplasty revascularization on the patient's second occluded coronary vessel. This multi-step procedure marked one of the first integrative approaches to treating coronary disease. 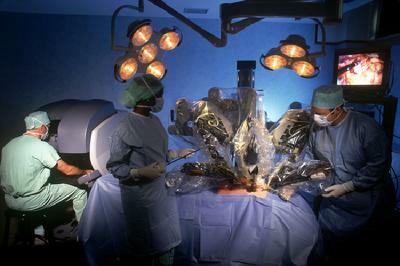 • In May 2006, The first unmanned robotic surgery took place in Italy. • In August 2007: Dr. Sijo Parekattil of the Robotics Institute and Center for Urology (Winter Haven Hospital and University of Florida) performed the first robotic assisted microsurgery procedure denervation of the spermatic cord for chronic testicular pain. • On May 12, 2008, the first image-guided MR-compatible robotic neurosurgical procedure was performed at University of Calgary by Dr. Garnette Sutherland using the NeuroArm. • In June 2008 the German Aerospace Center (DLR) presented the first robotic system for minimally invasive surgery with force-feedback in 7 dof in the tip of the instrument, distal of the 2-dof handwrist (MiroSurge). • In January 2009, Dr. Todd Tillmanns reported results of the largest multi-institutional study on the use of da-Vinci robotic surgical system in gynecologic oncology and included learning curves for current and new users as a method to assess acquisition of their skills using the device. • Also in January 2009, the first all-robotic-assisted kidney transplant was performed at Saint Barnabas Medical Center in Livingston, New Jersey by Dr. Stuart Geffner. The same team performed eight more fully robotic-assisted kidney transplants over the next six months. • In September 2010, The Netherlands - The Eindhoven University of Technology announced the development of the Sofie (Surgeon’s Operating Force-feedback Interface Eindhoven) surgical system, the first surgical robot to employ force feedback. • In September 2010, Slovenia - The first robotic operation at the femoral vasculature was performed at the University Medical Centre Ljubljana by a team led by Borut Geršak. The robot used was the first true robot, meaning it was not simply mirroring the movement of human hands, but was guided by pressing on buttons.